Welcome to the Math Salamanders Subtraction Games 2nd grade page. Here you will find our selection of free games to help your child learn their subtraction facts to 20, and to count back by ten. As well as printable games to support subtraction fact learning, we have also included some links to some great online games to develop subtraction skills at the bottom of the page. Using games is a great way to develop math skills whilst having fun at the same time. Learning facts which can, let's face it, be quite boring at times changes into an exciting game where kids are motivated and want to get better at. Many of the games on this page will also help to develop reasoning and strategic thinking skills as well as knowledge of subtraction facts. All the games come with detailed instructions how to play the game, and also a few variations and ideas of how to change the rules to make the game more interesting. 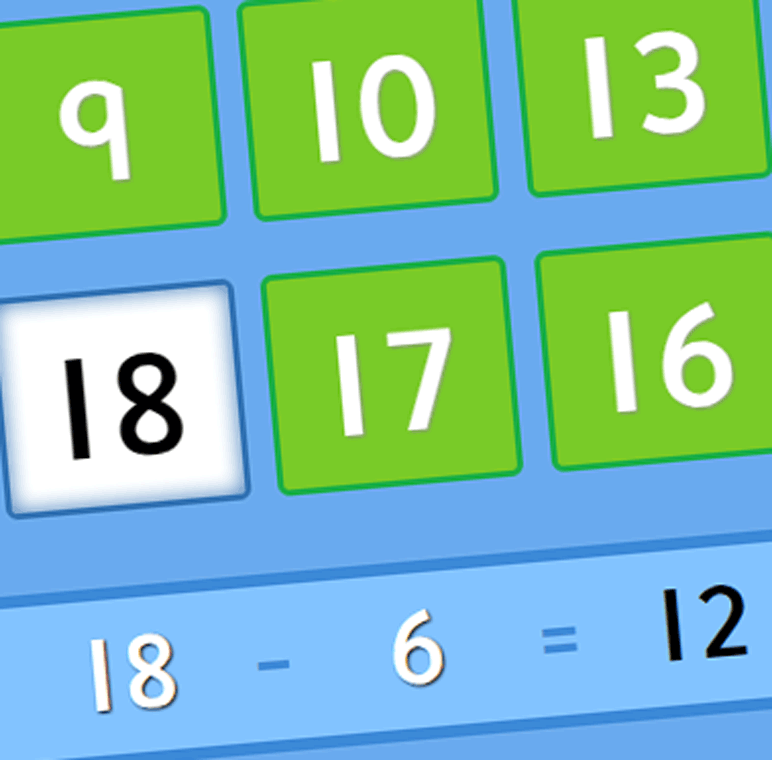 All of the printable games on this page are free to use and enjoy, and we have also included a few great online subtraction games that run on external websites to use. This subtraction game is a simple game which uses strategy and subtraction together to work out facts up to 12. It is a great game for children who are not yet ready to handle subtraction facts up to 20, but can are confident with facts up to 10. This game is good fun to play, though it can be quite frustrating at times! The aim is to be the first player to place all of your counters. However, if you manage to make a line of 3 counters in a row, you can remove one of your opponents counters from the board. This subtraction game is similar to the Cover Up game above, but uses numbers up to 20 and two dice to generate random number answers. The aim of this game is to match the difference on the difference grid with a subtraction fact on the main board. It is a good game for developing subtraction skills by using the difference where you count on from the smaller to the bigger number. The aim of this game is to create a path of unbroken counters from the Earth to the Moon using subtraction fact knowledge. A great game for developing quick recall of subtraction facts and also for strategic thinking of how to block your opponent. The facts involve a range of 2 digit numbers subtract 10. This is quite a specific game for developing this important skill. This is a simple calculator game which is great for developing strategic thinking as well as an understanding of negative numbers. The aim of the game is to be the player to reach a negative number on the calculator by subtracting either 10, 20, 30 or 40 from a given total. Looking for some easier math games? These games are at an easier level than those on this page. They involve adding and subtracting at a first grade level. We have selected a few websites which we think offer some great online games to develop subtraction skills. They are both external websites, and we are not responsible for the content of these pages. Using the links below will open the websites in a new browser window.